Filled with authenticity and raw emotion, Whitley is Kody Keplinger's most compelling character to date: a cynical Holden Caulfield-esque girl you will wholly care about. Whenever I pick up a book by Kody Keplinger I know I am in for a treat. Kody's books are relate-able and realistic portrayals of high school students This is most obvious in her debut The Duff. 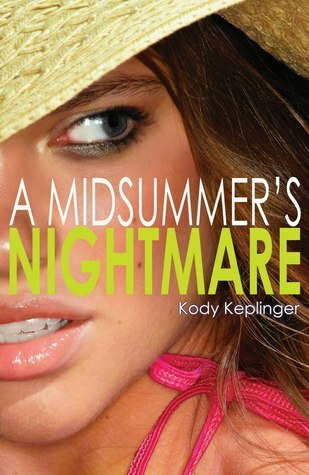 After The Duff, A Midsummer's Nightmare is my favorite of her books. Whitley was not my favorite main character. But I grew into her and by the end I wanted to be her friend. I love when an author takes an unlikeable main character and makes her sympathetic thus making me like her. Kody has done an excellent job of this in A Midsummer's Nightmare. I loved Nathan. He is a fabulous person and so sweet. I also adored Harrison who originally showed up a little in The DUFF so I liked getting to know him better, I would love to meet people like these boys! Some other characters from the Duff have a little cameo in A Midsummer's Nightmare and it was nice to see where they were. Overall I LOVED this book. I read it all the way through and when I had to stop I could'nt wait to go back to it to find out what would happen next. Summary: Fierce, seductive mermaid Syrenka falls in love with Ezra, a young naturalist. When she abandons her life underwater for a chance at happiness on land, she is unaware that this decision comes with horrific and deadly consequences. Review: Mermaids are one of my favorite mythical creatures to read about. I love them and I really like seeing all the different ways that authors can take them. 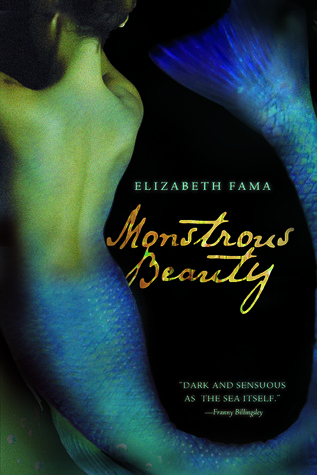 Case in point, I recently read Of Poseidon by Anna Banks and then I read Monstrous Beauty by Elizabeth Fama. Now I did not go into these books thinking that they were going to be anything alike but reading them in the span of a few months showed me just how different two mermaid books can be. Monstrous Beauty switches from present day to historical times, each chapter (until near the end) switches between Syrenka's story and Hester's story, and while we know they must be intertwined it is slowly shown just how much as you continue reading. Elizabeth Fama succeeded in writing a mildly scary book, it made me not want to go in the water. I think the reason she was able to achieve all this was because of the vivid and beautiful world she built. I could see the things happening and could imagine it being real. I liked Hester as a main character. Though I thought her to be stupid quite often and wanted to shake her for some of the decisions she made I could see why she made them. I also thought Peter was a great character and I wish he had been in it more. Curses, mermaids, ghosts, and historical towns. What else could you want in a book? The only thing I had problems with was that the beginning was a little slow and slightly confusing but once I started to be pulled into the story I couldn't look away! Since her release from Liberty Children's Facility, Anya Balanchine is determined to follow the straight and narrow. Unfortunately, her criminal record is making it hard for her to do that. No high school wants her with a gun possession charge on her rap sheet. Plus, all the people in her life have moved on: Natty has skipped two grades at Holy Trinity, Scarlet and Gable seem closer than ever, and even Win is in a new relationship.But when old friends return demanding that certain debts be paid, Anya is thrown right back into the criminal world that she had been determined to escape. It’s a journey that will take her across the ocean and straight into the heart of the birthplace of chocolate where her resolve--and her heart--will be tested as never before. Review: All The Things I've Done is the first book in this series and really beat up Anya. But it was nothing compared to all that she goes through in Because It Is My Blood. Just when it looked like her life couldn't get any worse she gets pummeled again. Now that's not saying that Because It Is My Blood is all upsetting drama and death. Natty and Anya's relationship grows and I loved watching Natty come into her own. Learning more about the chocolate business was also very interesting and I liked how Zevin went into it more. I also felt that Anya came into her own, I felt by the end she finally discovered what she wanted and was determined to fight for it. I love when there is clear character growth in a series. Gabrielle Zevin really set up the thrid book in the series and I cannot wait to see what happens next. 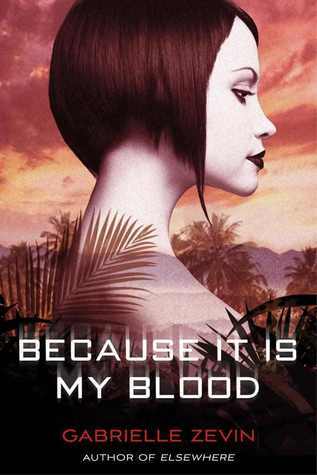 Even though I really enjoyed Because it is my Blood, parts of it were kind of dull and I wish the plot had been a little faster, but I definitely recommend this series. To find out more about All the Things I've done check out my review! And as you are waiting for the next book be sure to check out Gabrielle's other book Elsewhere! 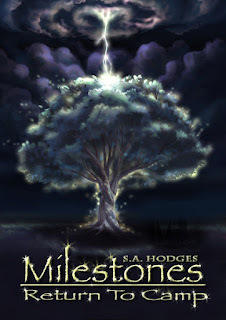 Today I have with me S.A. Hodges to tell us about the second book in the Milestones series Milestones: Return to Camp! Tell us a bit about the series and where you left it with book 1? In a nutshell.....Milestones (book 1) is about a teenage girl named Faye Martin, who gets hit by lightning. Her life then changes drastically. She then attends a summer camp where she meets wonderful friends but discovers they have all been hit by lightning too. They all soon realize that their meeting is no coincidence, and they spend their summer trying to unravel the mystery of their connection. The first book finishes after Faye discovers the BIG camp secret and heads back home to start her school year and hopefully, hook up with her longtime crush Benjamin Parker. The second book, Milestones: return to camp, picks up after Faye goes back to camp the following summer. She's bummed to find out Benji now has a girlfriend, and goes through yet another near-death experience. The campers bond over the discovery that there are many more secrets for them to uncover and they spend the summer investing their purpose in the world. Also, the evil characters finally surface and there's a big plot twist at the end! Has the main character evolved? Did Faye and Benji stay together? Not....... really. But there's more to it than that. You gotta read to find out! How long did it take you to write the sequel, there are three years between books will it be another three before book 3? It took me 3 years to write the sequel. But from start to finish, probably six months total. The thing is, I was in this silly thing called Residency between the first and second book. I was training to be a Pediatrician and I worked an average of 80 hours a week. So it didn't leave too much time for writing. Thankfully, that's done and over with and I now have a more "normal" life. So the next book will be released in less than a year. Who is you favorite character of this book? It's always been Melaine. Please note, her name is not Me-la-NIE but rather Mel-aine. There is so much more to her that meets the eye and her character is about to get much more complex. But she definitely has the best heart, best morals and best intentions of all. What would you like to tell your audience? I give away free YA books on my blog monthly! I think reading is so important and after I'm done reading books, I always give them away on my blog. So come and enter my contests and win a book (or two, or twenty). Plus, I think my blog is pretty funny sometimes, so that's a plus. Also, I love getting mail (email, snail mail, any kind of mail) so send me questions/thoughts/inspirations and I always try to write back. If you haven't read the first book and want more info here is my review and here is my interview with Samira about the first book. And be sure to look out for my review of Milestones: Return to Camp and a giveaway of the first book coming soon!